Operation Stack has moved up to phase two on the M20 in Kent after industrial action in France seriously affected cross-Channel travel. 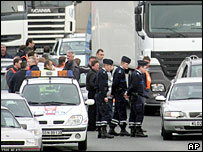 Riot police used tear gas to disperse striking French seamen at the approach to the Channel Tunnel on Tuesday. The strikers also blockaded berths at the Port of Calais, meaning delays for SeaFrance and P&O ferry services. The industrial action is in response to discussions in the French Parliament on changes to shipping laws. 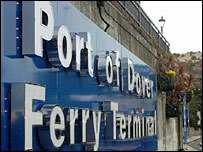 Ferry operator SeaFrance had already cancelled its Dover-Calais services because of the strike. All ships will be kept in Calais until Thursday morning when sailings are due to resume. P&O has also been affected with two ferries returning to Kent because they were unable to berth in Calais. Two more ships were used to carry freight to Zeebrugge in Belgium. P&O is operating ferries on Wednesday but they are subject to delays. Reports from France on Tuesday said protesters were dispersed from the Eurotunnel rail terminal at about 1200 GMT with only minor disruption to traffic. Kent Police implemented phase one of Operation Stack at about 1400 GMT on Tuesday, closing the M20 coastbound between junctions 11 and 12. Phase two came in at around 2000 GMT between junctions eight and nine. The operation allows lorries to queue on the M20 with other traffic being diverted onto the A20. On Monday, rail traffic was blocked for three hours after a group of about 100 striking workers cut through fences surrounding the terminal near Calais and invaded the tracks. Trains were stopped in both directions with 15 Eurostar services delayed. The seamen are protesting against a plan to reform the French national register for shipping, with sailors' unions saying the changes are a threat to French jobs. SeaFrance said when it stopped its crossings it hoped it would be able to transfer passengers to alternative services. Customers who had booked crossings for Wednesday are being advised to contact SeaFrance reservations.